When was the last time you reevaluated your equity? Over the last two years, the housing market has rebounded significantly, and with it home prices rose faster and more dramatically than anyone predicted. As home prices continue to rise, more and more homeowners are regaining equity in their homes. In fact, last year, more than three million homeowners regained equity. So no matter what your situation has been in recent years, chances are it has changed. 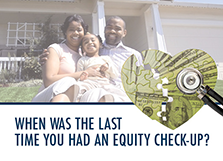 I have a report entitled “When Was the Last Time you had an Equity Check-Up” that explains recent changes in the market and why it’s important to reevaluate the equity you have in your home. You can download the report from my website. After reading the report, contact me today to discover how much your home is worth.